Here is a holiday sparkling punch that is satisfying without the sugar or calories. Bring a pitcher of this to your next party! Save some of the pomegranate seeds for garnish by floating the seeds in the drink. In this recipe, you juice the seeds and press the citrus. Preparing pomegranates for juicing is easy. It is the seeds inside that you are juicing, not the pith or skin. 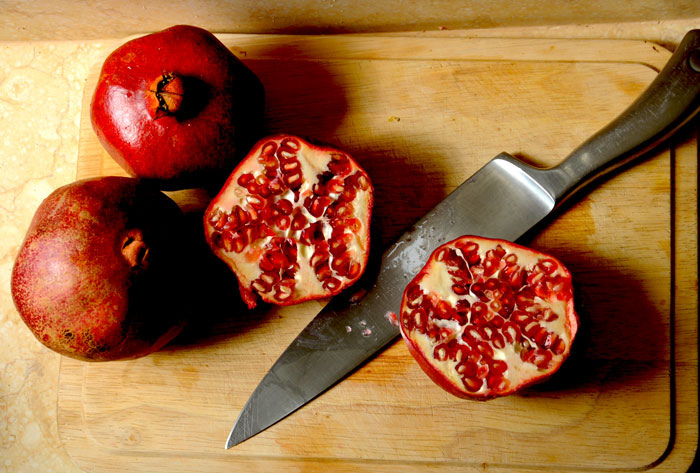 Simply cut the pomegranate in half and with the seeds side in the cup of your hand, over a bowl, and begin to pound the back of the pom with a spoon. The pounding will release the seeds. Use a citrus press or a juicer to juice the grapefruits and lime. Juice the pomegranates into a separate bowl. Combine the juices. Just before serving, fill a glass of juice mixture to half and top it off with sparkling mineral water. Photo courtesy Darla دارلا Hueske.